In 2011 Tetra Design Group was commissioned by SinuSys Corporation, a medical device company, to help launch its first product, the AerOs (now Vent-Os) Sinus Dilation System. Tetra evolved the SinuSys brand by creating a visual element that demonstrates how the product works. The visual element has been successfully used across multiple platforms such as a responsive website, brochure, booth graphics, data sheets, online advertisements and materials for clinical trials. • A skyscraper banner ad featured in the AAO-HNS online newsletter geared toward ENT (Ear, Nose and Throat) physicians. All updates and design of new materials were completed in late 2013. Upon FDA approval, Tetra was able to release the various components in the campaign to maximize the impact of the announcement. Having several months to work on all updates and new materials was crucial in having a successful launch. Everything was ready to go, making the execution seamless. 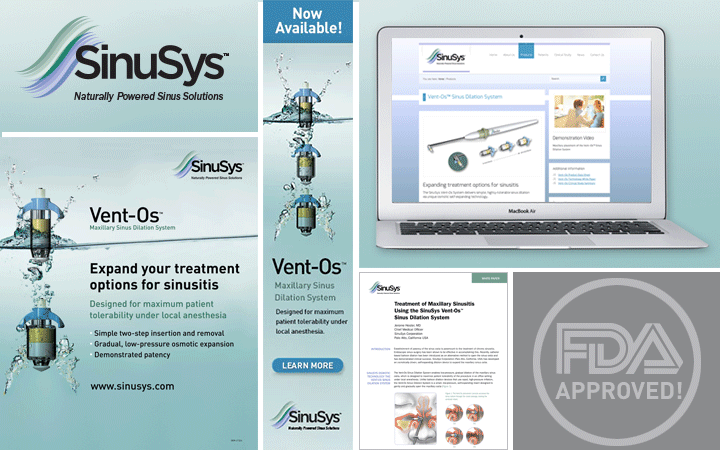 "Tetra Design Group helped us develop a great launch campaign for our new Vent-Os™ Sinus Dilation System. Their creative concept is resonating well with our target audience, and their work — covering branding, promotional/sales collateral and web marketing — was executed in a timely and cost-effective manner. I highly recommend them!"